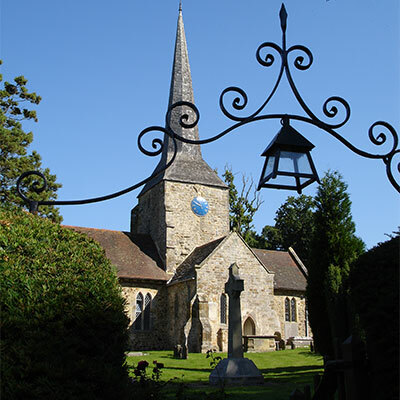 St Giles is at the heart of the rural community of Horsted Keynes. 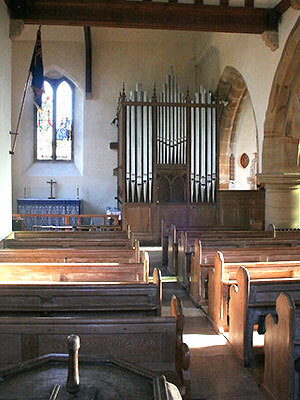 This historic church has stood as a beacon in the village for over a thousand years. At least forty generations have worshipped in this building and it is thought that worship on this site can be traced back to the time of St Wilfred. The original part of this church was built in Norman times, with subsequent additions added as the need arose over the centuries, leading to the beautiful eclectic style of this building as it stands now. However we can go back even further as parts of this building were erected upon the stone base of the previous Saxon church that stood in this place, making this a truly ancient site of worship. Please read on to discover more and explore this historic building. 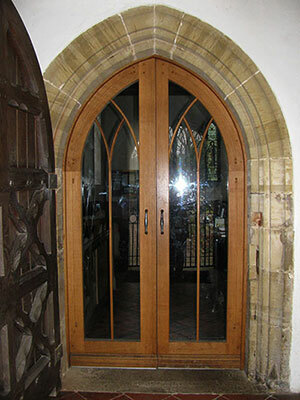 The main entrance into the church is through wrought iron gates and the beautiful modern double oak doors. 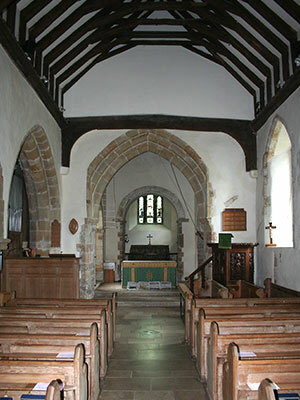 The main nave bordered by stone arches stretches out to the east, leading to the chancel and on to the sanctuary. The sanctuary forms the earliest part of the building and worship has been offered here for half the Christian era. 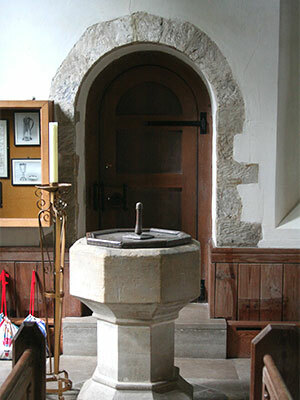 The Saxon door frame at the far side of the font is the oldest remaining feature of St Giles and was moved outwards to it’s current position when the north aisle was added in 1884 to accommodate the increased population of the village. 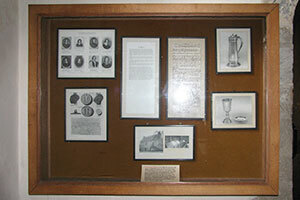 Besides the oak double doors you can find “The Rectors’ list”. This lists all the rectors of St Giles from 1177 to the present day and includes Giles Moore (1655-1679) famous for his Day Book chronicling life during the Commonwealth (the rule of Parliament under Oliver Cromwell) and the Restoration of the Monarchy under Charles II. 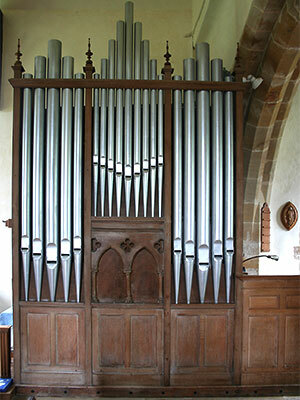 The organ by Brown of Canterbury was built in 1904. 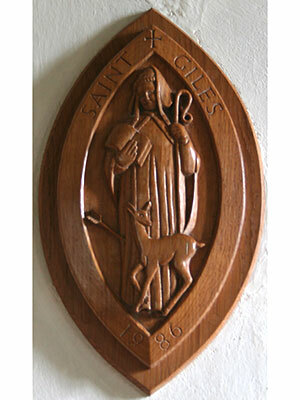 The medallion of St Giles (1987) carved by Maurice Emmans recalls the wounding of St Giles by an arrow whilst rescuing a deer, this is the origin of St Giles being the patron saint of both hunting and of the crippled. 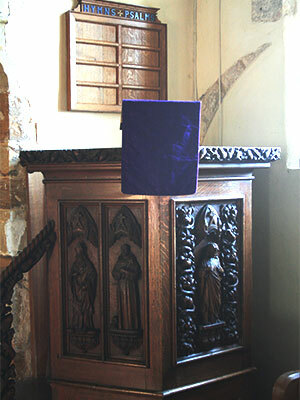 The pulpit carved by Captain Louis Wyatt depicts figures of Christ, St Joseph, St Peter, St Augustine and St Francis. Captain Wyatt lived in the village and was sixty-seven years old when he carved them, they were the first figures which he had ever attempted. 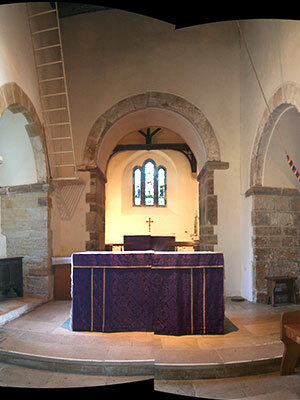 The church was originally built in a cross shape with the chancel at the centre point. This cross shape was lost when the side chapel that was through the north arch of the chancel (northern transept) was demolished in the 12th century. 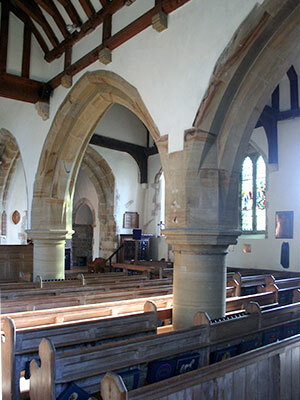 In the 13th century the Chancel and south transept (now the sacristy and choir vestry) were rebuilt, supplementing the rounded Norman arch to the sanctuary with one pointed in the ‘Decorated' style. Above the chancel, the Tower, rebuilt over 800 years ago on the original Saxon stone base, has four foot thick walls and became the most prominent building for miles around at that time. Around 1604 the tower grew to even greater height when an 80ft octagonal broach spire was added to the top of the tower. The Tower houses 3 bells, only one of which is roped and in regular use. It also houses the electronic mechanism for the Clock on the exterior southern face of the tower. 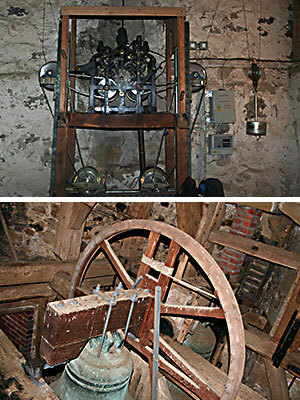 Access to the mechanism is via the white partial ladder in the chancel. N.B. There is a small cross engraved on the chancel floor by the sacristy door it was commissioned by Jane Mallender in blessed gratitude for her lucky escape in 1988 when a clock weight crashed through the tower floor to the chancel below. 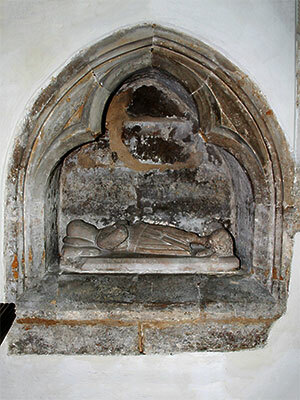 The ‘little crusader’ effigy on the left hand side of the chancel is thought to be a member of either the de Cahaignes or the de Lewknor family, who died in the Crusades. It is also thought that the dead crusader’s heart, encased in silver, was brought back to Horsted Keynes and buried in St Giles Church. The de Cahaignes family came from Cahagnes, in France and a knight of the family fought for William the Conqueror at the battle of Hastings. For this service to William he was gifted the place called Horsted and subsequently added his own name to the original Saxon name. Thus the village became Horsted Keynes. Our village has been twinned with Cahagnes in France since 1971 and annual exchange visits are organised. Next to the crusader is an upright stone coffin lid believed to be of a Lord Prior of the Benedictine Monastery of Lewes that once staffed St Giles. 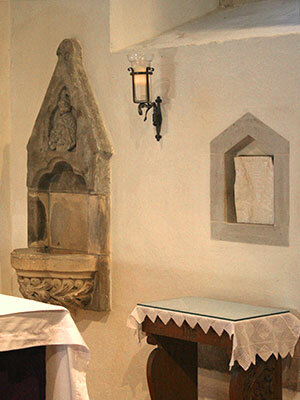 To the right of the High Altar, a candle burns to mark the perpetual reservation of the Body of Christ in the Blessed Sacrament in the nearby aumbry (a small locked recess built into the wall of the church). The sacrament is reserved so that it is always available to enable the priest or another minister to take it to the sick or dying. 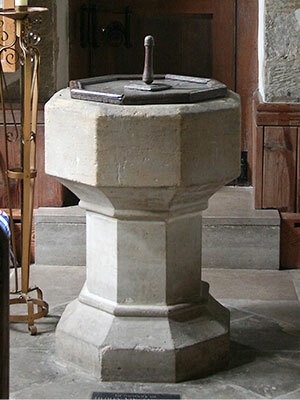 In the corner, also to the right of the High Altar is the piscina (a stone basin used for the washing/cleansing of sacred vessels such as the chalice). There is a small statue of a priest holding the bread and wine above the piscina, which was recovered from the tower wall and placed here as part of the 19th Century restoration of the church. Above the High Altar is The Crucifixion window. It is by the local 19th century stained glass artist Charles Kempe who also created the west (Presentation) and south (Nativity) windows. In each window you might spot his trademark little wheat sheaf. To the left of the arch back into the Chancel is a covered- in arch which, until its demolition in 1850, was the entrance to the14th century Marie de Bradehurst Chapel dedicated to the Virgin Mary, the private chapel of the owners of Broadhurst Manor. After the demolition of the Chapel a small National School was built on the land to provide education for poor children. Horsted Keynes already had one charity school that gave places to children whose parents could not afford to send them to school. That school was given to the village in 1708 by the lord of the manor, Edward Lightmaker which in the 1800’s educated twelve poor children free of charge. The building of the new school provided some interesting memorials on the walls in this part of the church which probably came from the Marie de Bradehurst Chapel. Look out for the Pigott memorial and note ‘the babe who died before he was born’: Henry Pigott born December 1715, died March 1715. In those days the year ran from 25th March (Lady Day) rather than 1st January. 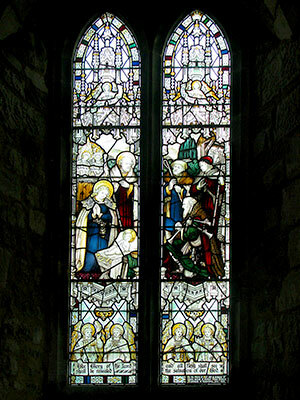 The Kemp window depicts St Stephen and is in honour of Sidney Peek (1889-1910). Sidney Peek was a teacher at St Giles School, and served as a highly resourceful missionary in what is now Malawi, he died of black water fever in 1910. 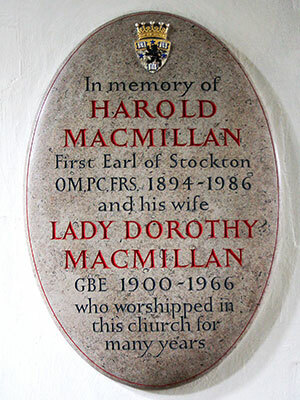 Harold Macmillan, British Prime Minister 1957-1963 and his wife Lady Dorothy attended St Giles and lived at Birch Grove House. 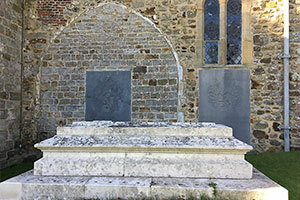 The Macmillan family grave can be found in the church yard. The display case to the left of the Saxon door commemorates Archbishop of Glasgow, Robert Leighton (1611-1684) a great scholar and builder of Christian unity whose grave is prominent in the church yard on the south side of the Sanctuary. The window of St Monica depicts St Monica’s home for sick and incurable children. 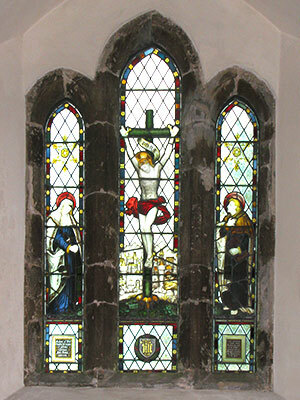 The home was founded 1874 in Kilburn by Lucy Forster and Katherine Marshall, commemorated in this window. 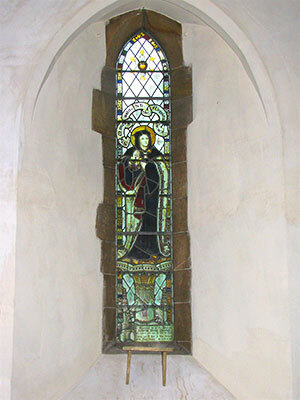 This window is in memory of Katharine Marshall and the Caritas window in the north chancel is in memory of Lucy Forster. In the North Aisle looking eastward towards the Lady Chapel. The three-bay arcade of arches are all that remains of the original north wall. The North Aisle was added In 1885 to accommodate the increasing size of the congregation. The Nativity window is dedicated to Mary Benson who died in 1918, wife of Edward White Benson, Archbishop of Canterbury from 1883-1896. Upon the death of Edward while in office as Archbishop, Mary had to leave Lambeth Palace, Queen Victoria offered her the use of the Royal Lodge at Windsor Park but Mary chose instead a large country home near Haywards Heath. Edward and Mary had six children, two of which died relatively young. The surviving children all became notable as writers, Arthur Christopher Benson became a poet and prolific author who wrote the words to “Land of Hope and Glory” and became the 28th Master of Magdalene College, Cambridge, Edward Frederic Benson wrote the Mapp And Lucia books and Robert Hugh Benson an Anglican priest before converting to the Roman Catholic Church was also a prolific fiction writer, favouring horror and ghost stories as well as children’s fiction, he also wrote the novel “By What Authority” about the English Reformation based in a slightly disguised Horsted Keynes. 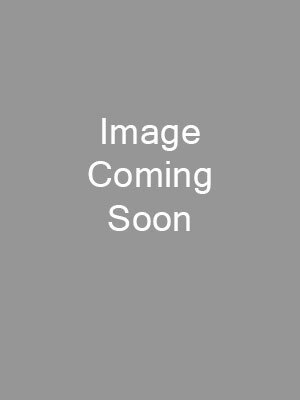 Not to be left out Margaret Benson was one of the first women to be admitted to Oxford University and also became an author and amateur Egyptologist. The inscription reads "‘Here rest the remains of Robert Leighton, Bishop of Dunblane, afterwards Archbishop of Glasgow. 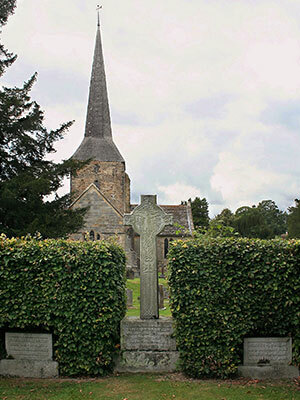 In an age of religious strife he adorned the doctrine of God his Saviour by a holy life and by the meek and loving spirit which breathes through his writings.’"
The Cross stands tall between the two hedges marking the Macmillan family grave and the burial place of Harold Macmillan. The Cross is a replica of the Macmillan Cross that can be found at the historical site of Clan Macmillan, Kilmory Knap Chapel, Argyll and Bute. 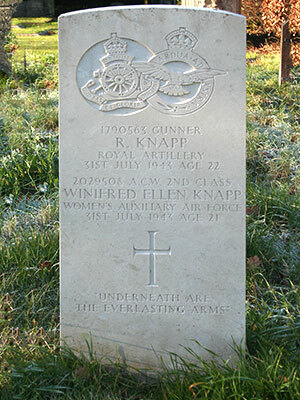 Further beyond Harold Macmillan’s grave you will see the white military gravestone of Gunner Knapp and his WAAF wife Winifred. This grave marks the end to a tragic story when, after their wedding reception the newly wed couple headed home to Nobles’ Farm along the railway tracks in a thunderstorm. Not hearing the train approaching behind them they were run over on their wedding day, 31st July 1943. The combining of army and air force symbols is a unique tribute.